THE One Young World summit will arrive in Dublin city this October and Ireland’s business elite are to give the international event their support. Dozens of well-known and well-respected people from their respective fields turned out at the Mansion House in Dublin this morning to hear about plans for the forthcoming conference and what it will offer to the capital. 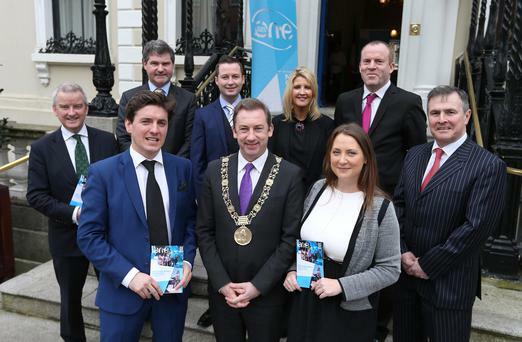 One Young World 2014 will be held across Dublin from October 15 to 19. Guests in attendance at today’s breakfast launch, hosted by Lord Mayor Oisin Quinn, included representatives from Google, Dell, Diageo and HSBC. The Lord Mayor told Independent.ie of the economic benefit to the city in welcoming over 1,200 delegates from over 190 countries this autumn. “This is undoubtedly one of the most exciting events to ever be held in this city and from what I’ve heard, it will generate €2m to €3m for the economy. “We have been trusted in making this an unforgettable event for some of the world’s brightest young leaders and it is our responsibility to inspire them with what makes Ireland great,” he said. The One Young World summits have previously taken place in London, Pittsburgh, Zurich and Johannesburg, with such names as Sir Richard Branson, Bob Geldof and Kofi Annan among the counselors to get involved and share the secrets of their success and inspire the next generation of leaders.